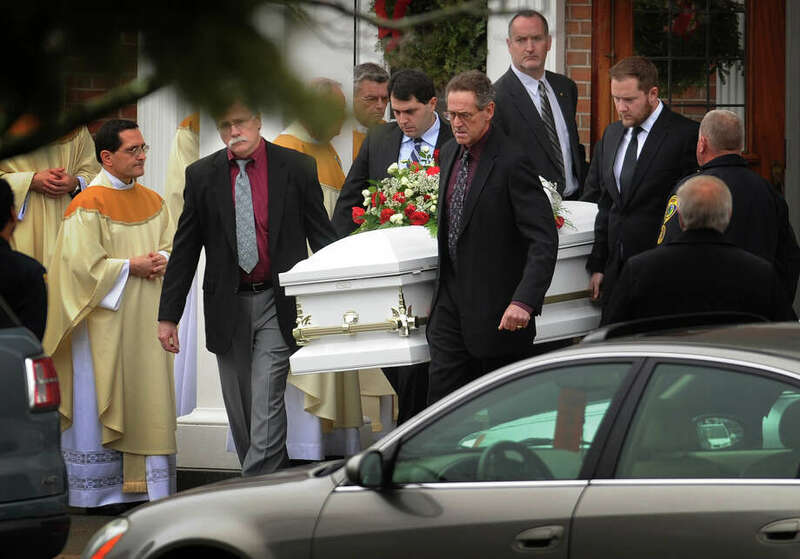 The casket of James Mattioli, one of the twenty students killed in the Sandy Hook Elementary School shootings, is carried from St. Rose of Lima Catholic Church in Newtown on Tuesday, December 18, 2012. NEWTOWN -- A hearse obscured the view of the manger outside St. Rose of Lima Church on Tuesday during the first of two funerals for victims of last week's mass shootings at Sandy Hook Elementary School. Inside the church, James Mattioli's mother, Cindy, spoke about the positive, endearing things she remembered about her son, said one person who attended the funeral, but did not give her name. "It was a powerful message," she said. James, who was called `J' by family and friends, was a delightful 6-year-old boy who loved sports and hamburgers with ketchup, according to accounts. He also loved to sing at the top of his lungs and swim like a fish. James was an early riser and, according to family members, was his father, Mark's, "mini-me." He especially loved being outside, even on days like Tuesday, when a chilling drizzle fell across the church lawn, clinging to white angels hung on a tree framed by a growing collection of candles, flowers and balloons. Many who walked past the display on their way to the church stopped at the memorial. Some added to it. "Heaven gained an angel today," read one sign posted outside the church. There were lots of hugs and tears before and after the service. James' mourners included children his own age, some in suits, and many who didn't know him. As the church bells began to toll, Richard Rosiak, a former New Britain resident visiting the area from California, said he stopped by with his two young daughters to pay their respects. "It really didn't hit me until this morning when I started hearing about it. Normally, when you are going to a funeral, you are expecting someone older," Rosiak said. Another couple, Radya and George Martino, drove to Newtown from Queens, N.Y. Radya Martino said she hasn't stop crying since Friday, the day a 20-year-old gunman shot and killed 20 students and six staff members at the chool. "I prayed for them in my mosque Friday," she said. The street in front of St. Rose of Lima Church was jammed with police motorcycles and television news trucks. About halfway into the funeral for James, mourners for Jessica Rekos, another 6-year-old victim, started to arrive and were directed to a nearby school to wait.